I worked on UI and graphics firmware at Pebble from April 2015 until the company was acquired by Fitbit in December 2016. 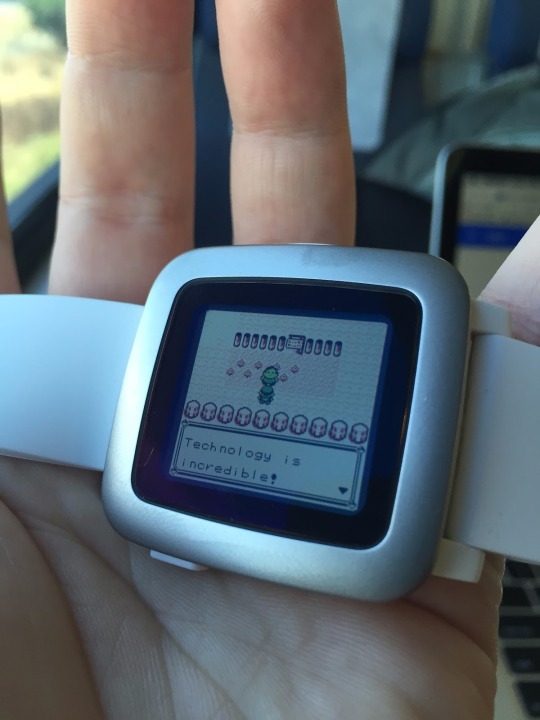 One of my favorite internal hackathon projects I worked on with some Pebble coworkers involved porting Game Boy emulators to the Pebble Time. 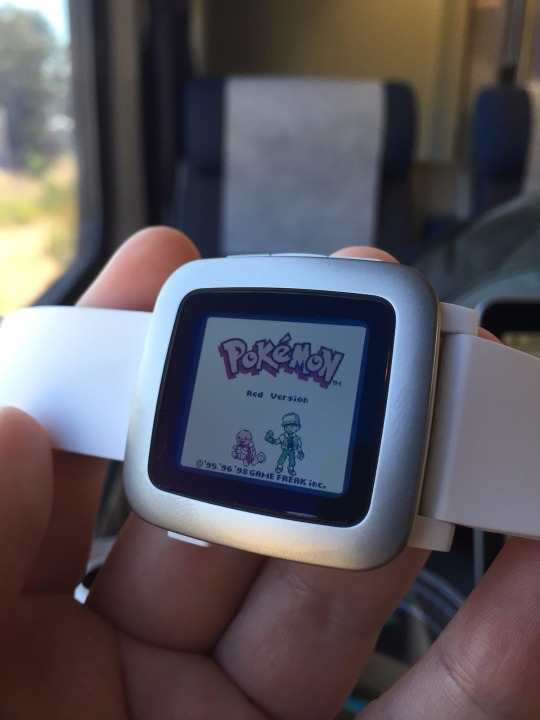 We worked on two versions of this project; one version ported a Game Boy emulator into a custom version of the Pebble Time firmware, and another version ported a different Game Boy emulator into a regular Pebble Time app built with the public Pebble SDK. Both versions only ran original Game Boy ROMs (i.e. no Game Boy Color ROMs), although they both did support games with custom color palettes. Around May 2015 I worked with Varun Reddy to port a Game Boy emulator called BitBoy (which is itself an ARM port of the gnuboy Game Boy emulator) to the Pebble Time. We picked BitBoy because it was written in C and had already been demonstrated to run on the ARM Cortex M4 STM32F405 CPU (168 MHz 192 KB RAM), which is in the same family of processors as the Pebble Time’s ARM Cortex M4 STM32F439ZG CPU (run at 100 MHz, 256 KB RAM). Note that we reserved the back button for easily exiting the emulator app. By utilizing frameskip we were able to achieve performance of about 24 FPS, making this version of the Pebble Game Boy emulator reasonably playable. 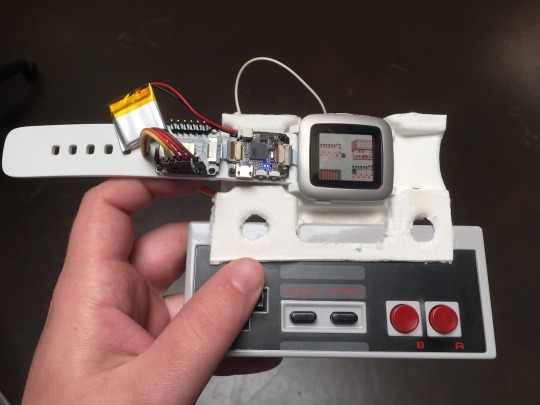 Brian Gomberg worked on connecting an NES controller to the Game Boy emulator via the Pebble Time’s smartstrap port. 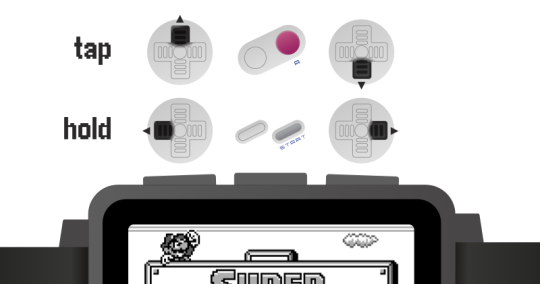 He used an early version of the Seeed Studio RePhone (Xadow) smart strap kit to interface the controller with the smartstrap port, and he modified our custom Pebble firmware to forward signals from the smartstrap port to the Game Boy emulator. We chose PlutoBoy as the emulator to port because it was written in C, ran on our Mac laptops using SDL (which made it fast and easy to test changes we made to the emulator to support the Pebble), and it was already structured in a way that abstracted hardware specifics to support multiple platforms (which made adding the Pebble Time as one more platform easy). The Pebble SDK RAM constraints (only 64 KB for RAM and code combined) did not allow us to load any ROMs (the smallest being 32 KB) completely into memory, so instead we used a cache to load chunks of the ROM into memory on-demand. This method worked but was quite slow because the memory had to be copied from the kernel into userspace on each cache miss. At best it ran at only about 14 FPS and was not realistically playable. As you can see in the video, we used the same button control scheme for this version as we did in the previous iteration of the project. I realize that some people may be interested in the source code from these projects, but unfortunately I cannot release them because I neither have access to them anymore nor do I own the code. These projects were done for internal hackathons and thus Pebble (now Fitbit) owns them. I enjoyed working on these projects with my coworkers because I grew up playing games like Pokemon on the Game Boy, and so it was fun to learn more about how the Game Boy hardware works as well as gain some experience porting 3rd party code to new hardware platforms (which I’ve already found useful in several other projects). Many thanks to Heiko Behrens, Brian Gomberg, and Varun Reddy for reviewing drafts of this article and for their work on these projects.